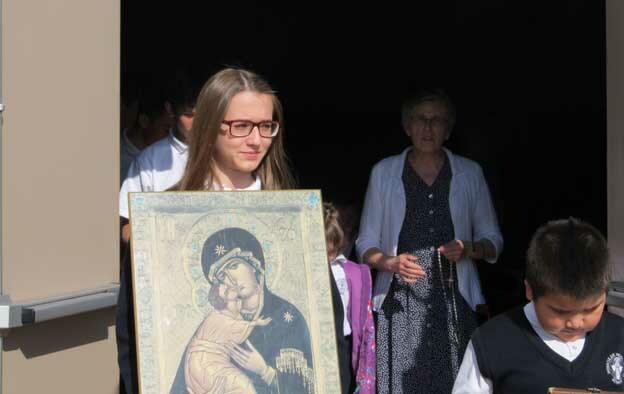 Praying and honouring the Blessed Virgin Mary during the month of May has been a Catholic tradition since the seventeenth century. 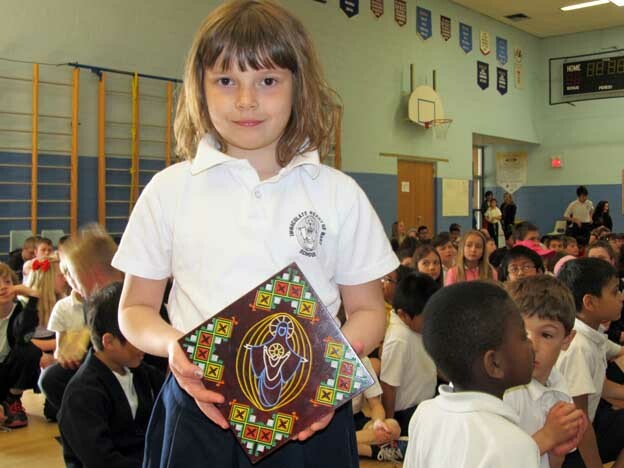 This devotion to Mary is especially meaningful to IHMS because of her prominence in the school’s name, and in the order of Sisters who own and operate the school. 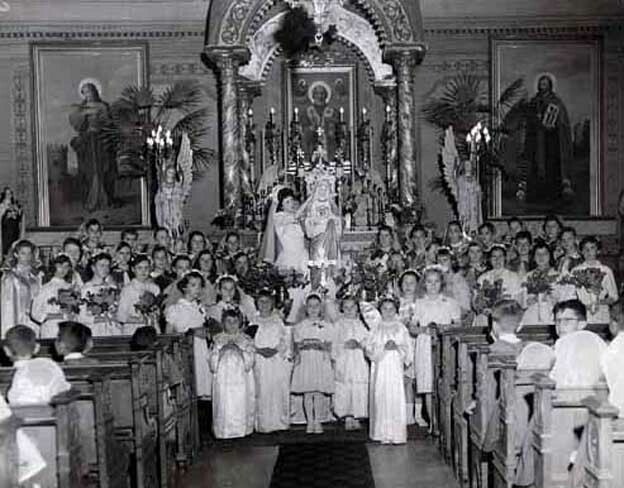 In the past, both St. Nicholas School and Immaculate Heart of Mary Academy held “Crowning of Mary” ceremonies every May. 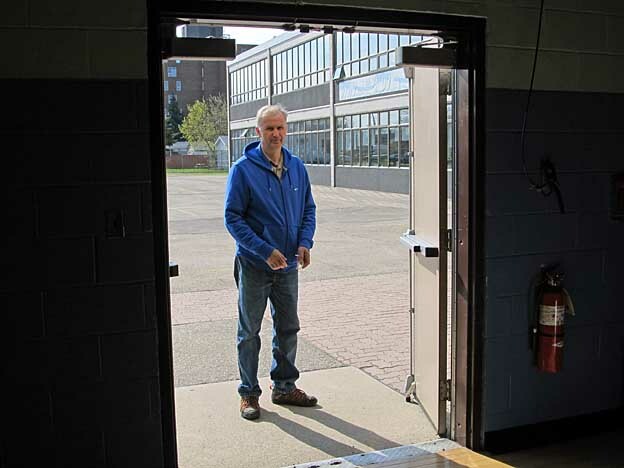 Both of these schools are affiliated with IHMS because both were owned and operated by the same religious order that own and operate IHMS – the Sisters Servants of Mary Immaculate. 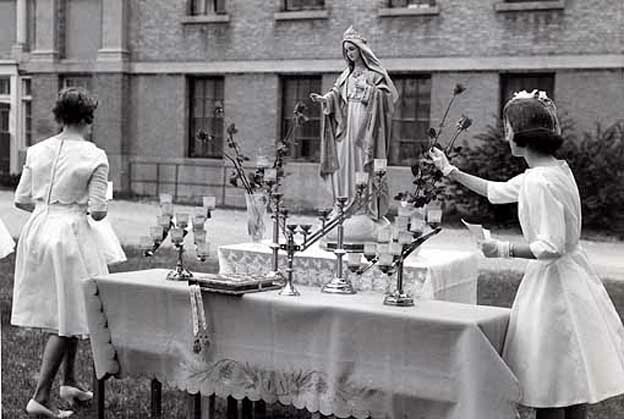 The top photo is an outdoor ceremony at Immaculate Heart of Mary Academy (a short lived all girls high school that ran from 1957-1963) while the bottom photo shows St. Nicholas School students conducting their Crowning of Mary ceremony in the old church of the same name. 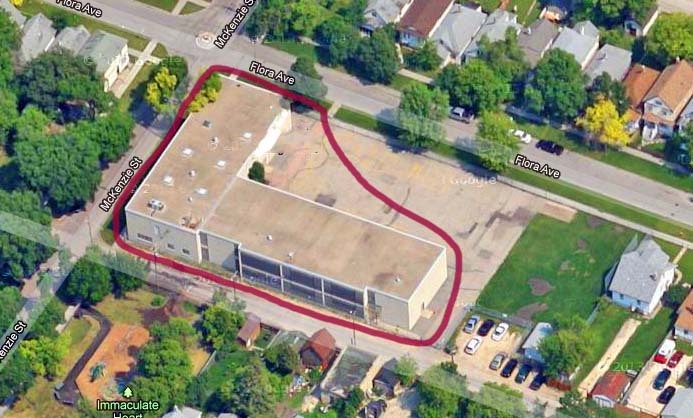 St. Nicholas School, of course, eventually became Immaculate Heart of Mary School in 1962. 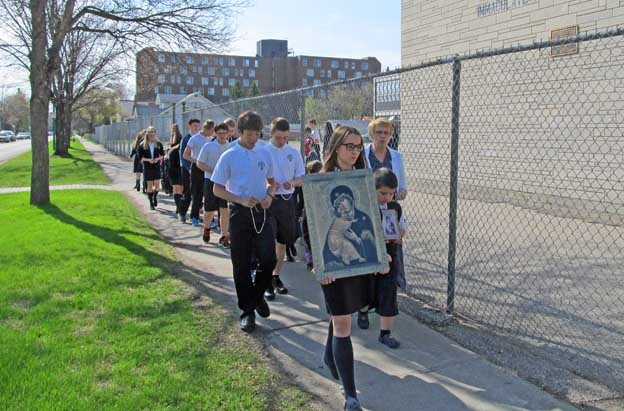 For the past 13 years, IHMS has initiated a prayer service and rosary walk for Mary in May, and this year it was held on Friday, May 23rd. 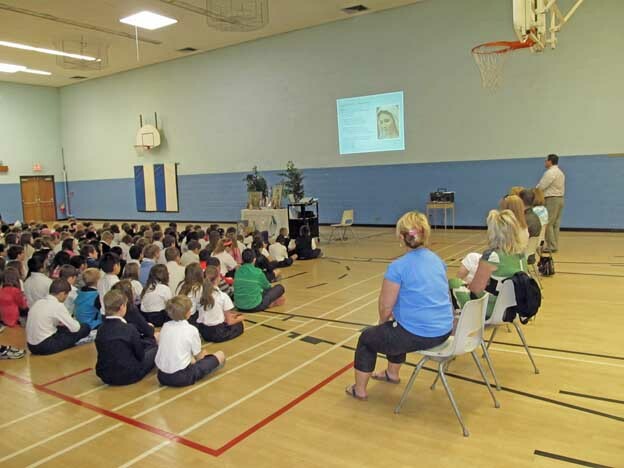 The prayer service began with students and staff gathering in the school gym at 9:00 a.m. immediately after the morning’s opening exercises. 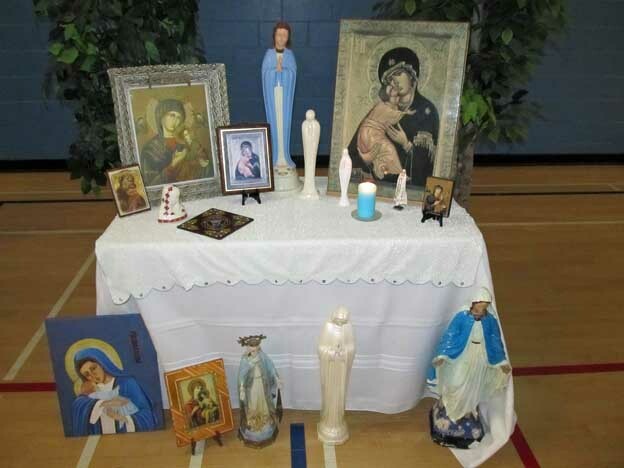 As usual, the students sat on the floor facing a temporary altar that was set up in the center of the gym. The altar held various statues and icons of Mary that were collected from prayer corners from each of the different classrooms. 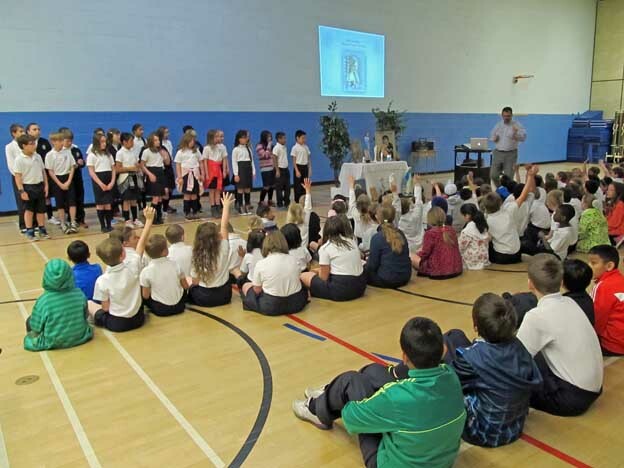 With the students quietly sitting on the gym floor, Mr. Picklyk welcomed everyone and began the prayer service with the grade 5 students reciting the “Hail Mary” in French. 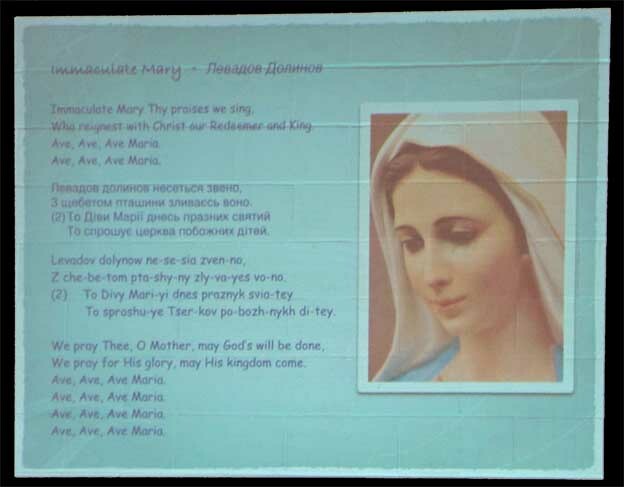 Mr. Picklyk then played a musical piece about the Blessed Virgin Mary that was accompanied by various projected images of her on the gym wall. 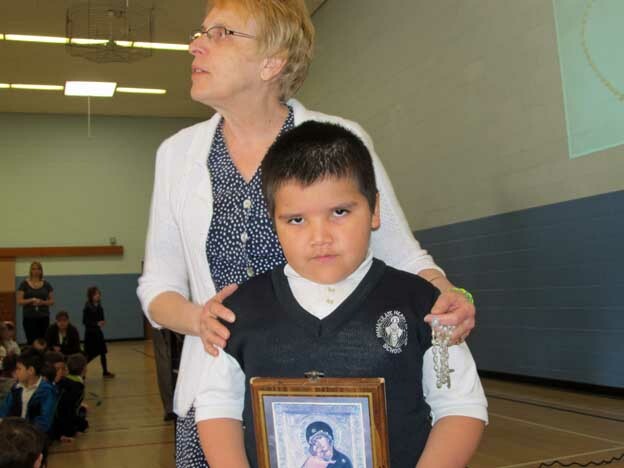 This was followed by the song “O Maria” which the students sang. 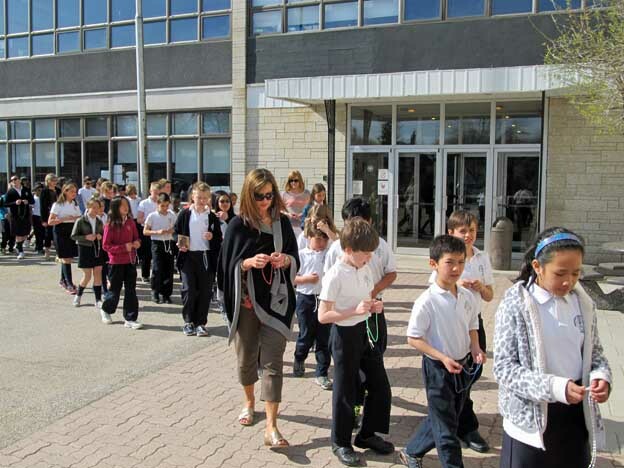 Since everyone was gathered for a Rosary Walk, most students brought their own rosary beads from home. 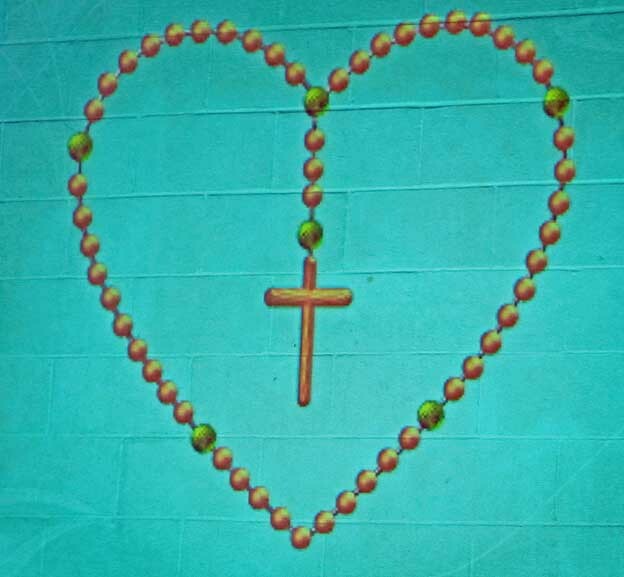 Mr. Picklyk then spent some time talking about how to pray the rosary – 10 “Hail Marys” followed by an “Our Father”. 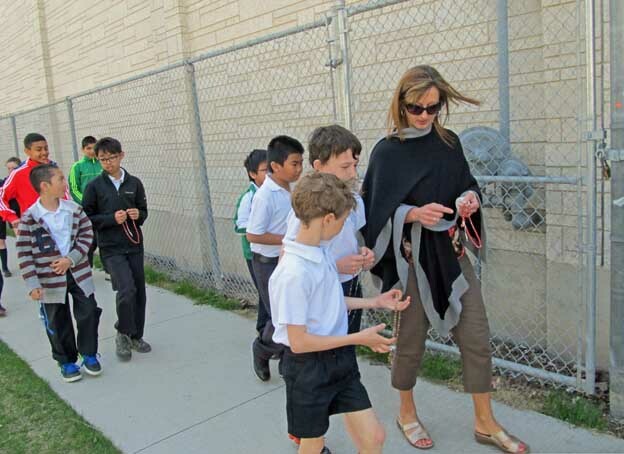 Students who forgot to bring a rosary from home were told that they could keep track by using their 10 fingers. 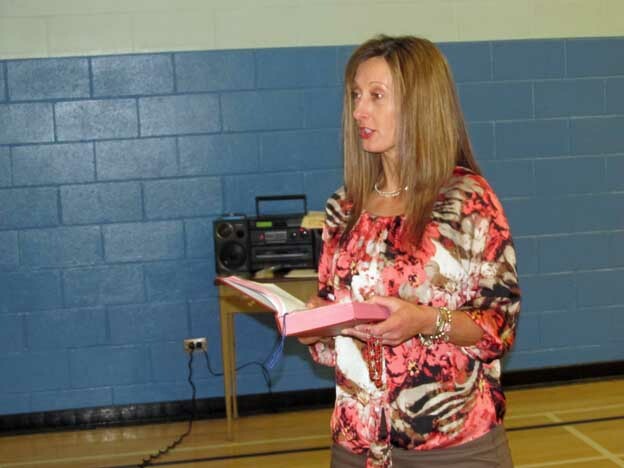 Mrs. Tycholis, the school’s grade 3 teacher then read a passage from the Gospel about Mary’s visitation from the angel Gabriel. 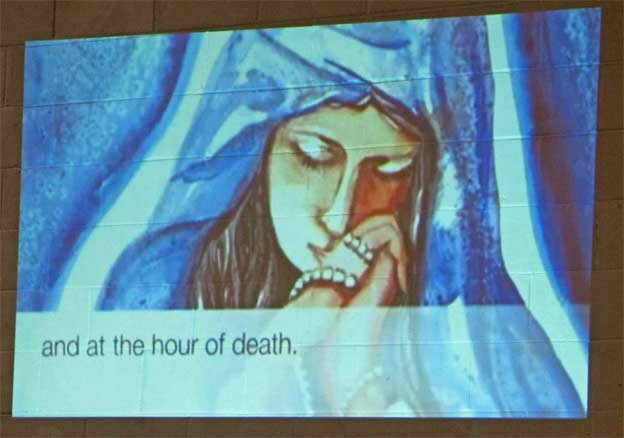 The passage described Gabriel’s announcement to Mary that she will be giving birth to the Son of God. 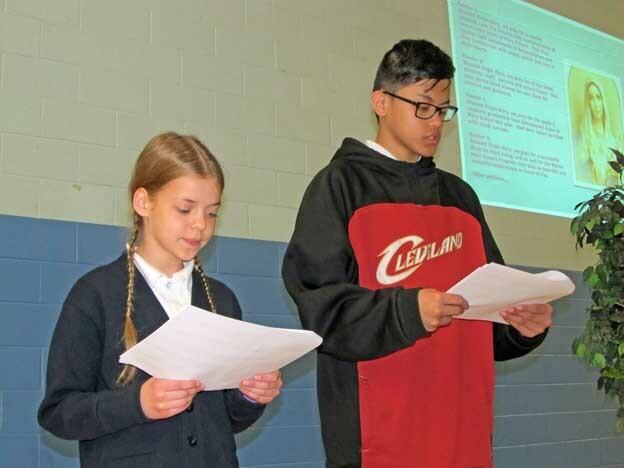 Next, Russell C. (student council president) and Mary M. (student council vice-president) read a set of petitions, after which everyone replied: “Oh Mary, Mother of God, Pray for us”. 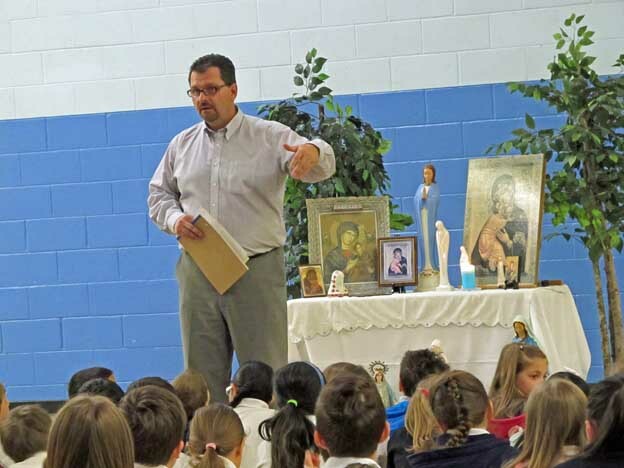 Mr. Picklyk then called a preselected student from each grade to approach the altar and receive either an icon or statue of Mary. 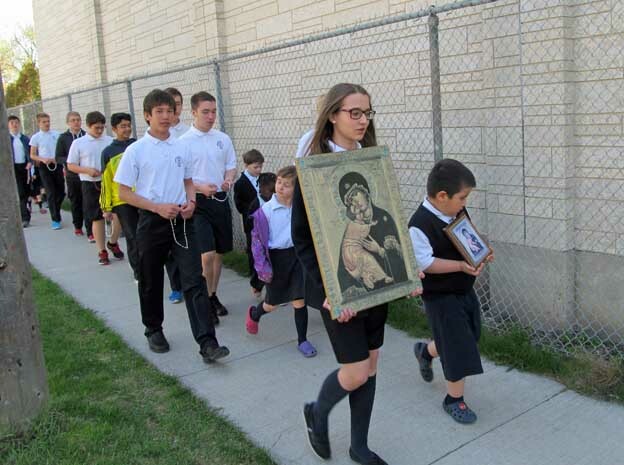 These students had volunteered to carry an icon or statue while leading their class on the walk around the school. 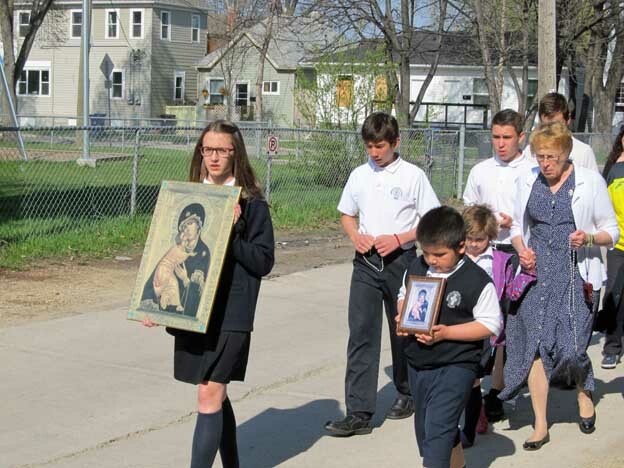 The procession began with the Kindergarten and grade 8 students (who paired up together), followed by the grade 1 and grade 7 students (who also paired up together), followed by the rest of the grades. 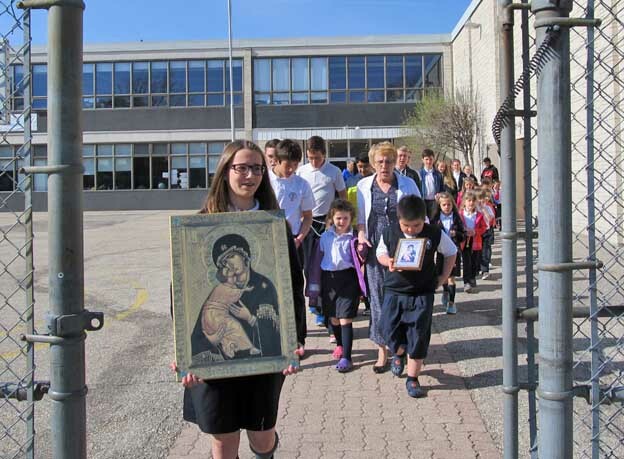 Taylor D., a grade 8 student, led the procession with the school’s large icon of the Blessed Mother. 2. 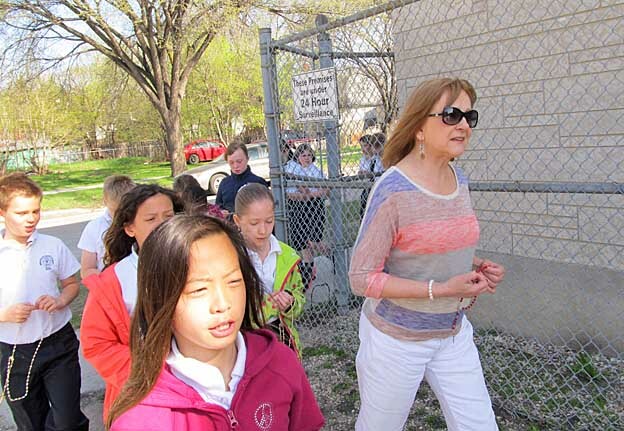 Through the front gates and west down the sidewalk to McKenzie St.
Basically, the students walked through the playground and around the school twice. The entire walk lasted about 10 minutes. 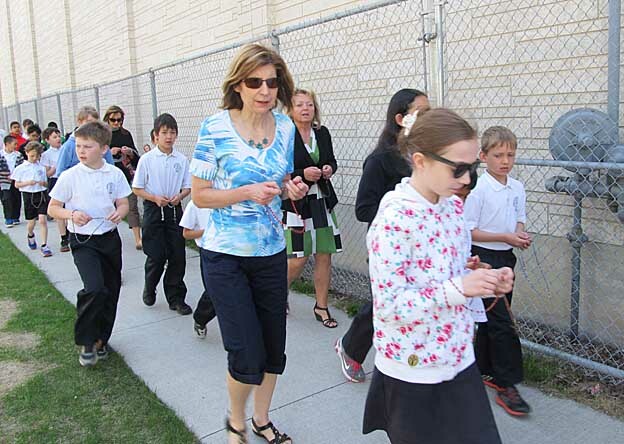 During the walk, the students recited the rosary, and continued to do so for 2 complete laps around the school. 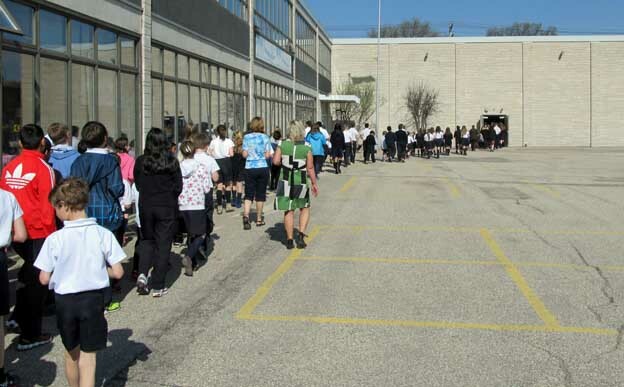 After the second lap, everybody filed back into the gym to finish off the rosary and to sing “Ava Maria” as a closing hymn. 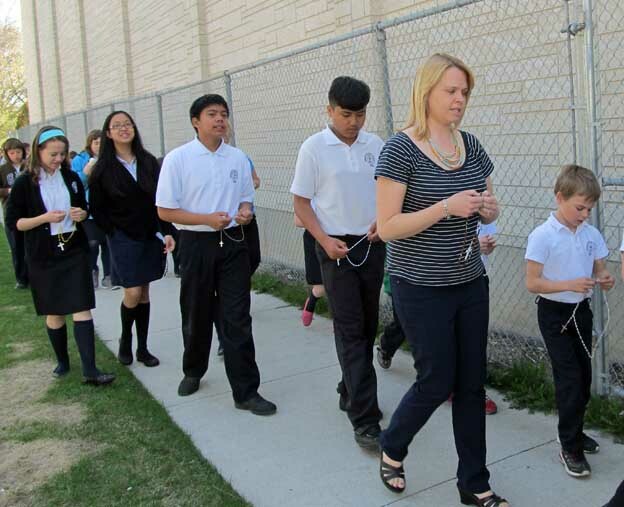 A Winnipeg radio station, CKJS, has been praying the rosary from 10:30 – 10:45 every weeknight for the past 37 years. CKJS can be found at 810 on the AM dial.